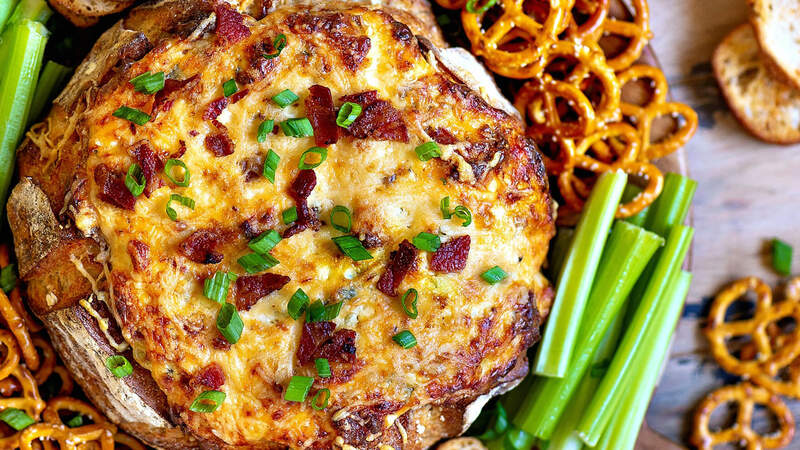 This Baked Bacon Cheese Dip is the ULTIMATE party food. This creamy cheese dip is made with five different types of cheese, is loaded with bacon and baked up a bread bowl that makes serving a breeze. Cut top off the bread and scoop out the insides leaving a 1-inch layer of bread in the bread bowl. Brush the insides with olive oil and bake for 10 minutes. In a large bowl, combine cream cheese, sour cream, mayonnaise and Tabasco. Mix until combined. Stir in cheddar cheese, mozzarella cheese, pepper jack cheese, green onions, and bacon. Carefully spoon filling into bread bowl and top with Parmesan cheese. Reduce heat to 375F and bake for 45 minutes to an hour or until dip is heated through and cheese has melted completely.